Chiang Mai is a lively city brimming with life at all hours of the day and, with so much to see,tourists and travelers are likely to need a few pick-me-up drinks throughout the day. However drinking good coffee in this ancient city can seem daunting as there are so many cafes and coffee stalls. Why waste your time sipping mediocre coffee when there is an array of amazing cafes to experience hidden away among the temples. Within the moat area the Old City is a charming mix of history, culture, and tourism. Visitors usually spend the day wandering around, stumbling into temples, experiencing the culture, markets, and monks as well as getting a glimpse of everyday life hidden inside this ancient city. There is a lot to see here, and it’s best to explore on foot, so why not grab a cup of java to go – and Thailand excels at takeaways! There are coffee stalls set up on every corner ready to serve you a strong, iced cappuccino. 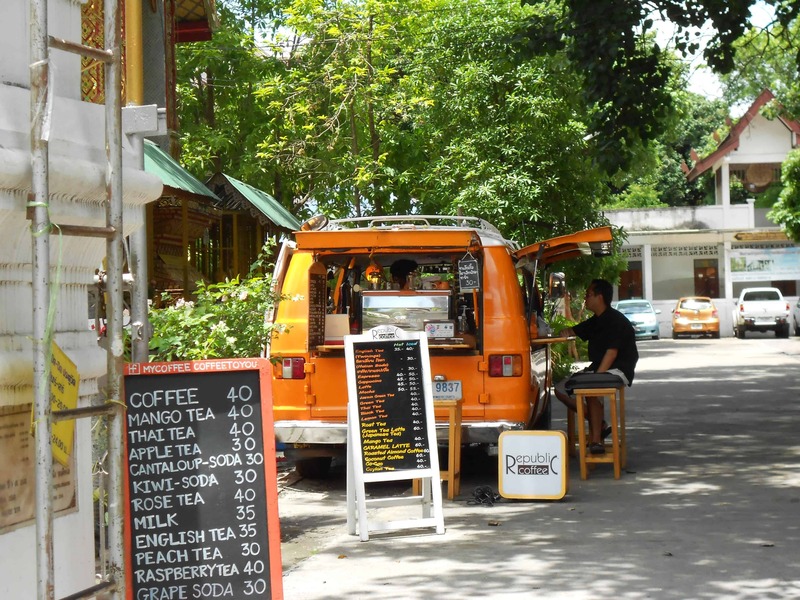 One of the most popular stalls scattered throughout the city is called ‘Miracle Coffee’ but a personal favourite is Republic Coffee: a bright orange van located inside Wat Sri Gerd, the perfect setting to take a break and get refueled. When you are in holiday-mode, you want to start the day right; so, head to ‘Good Morning Chiang Mai’ for a leisurely morning brunch. GMCM is located on a small, quiet soi (alley) next to a temple and occupies a beautiful and large wooden structure with a garden out back. The pancakes are great, coffee smooth, and if you’re lucky the big comfy sofas will be free! 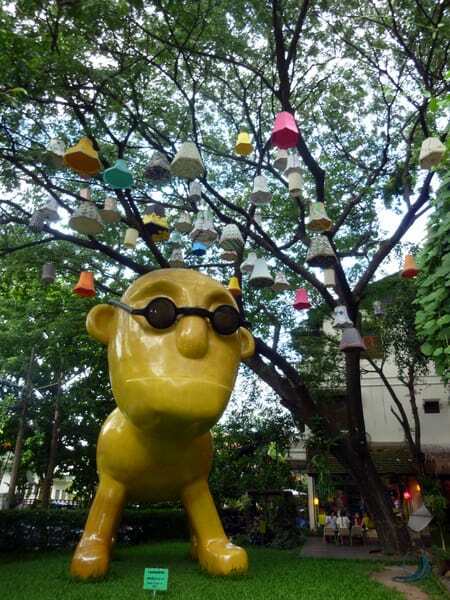 Rist8to coffee in Chiang Mai, Thailand. If you’re one of those people who classify coffee as ‘black gold’ and are willing to travel the extra mile for a good cup of beans, then head to Ristr8to on Nimenhamen Road for arguably the best coffee in Chiang Mai. Importing the finest beans from around the world, you’ll need to come early (and caffeine deprived) to get a seat and sample the beans of various origins. If it’s busy, have patience, their coffee is worth the wait!! For visitors who bring work along with them – either by choice or necessity – or for the growing hub of digital nomads and online entrepreneurs ‘residing’ in Chiang Mai, check out the Birds Nest Cafe. A cozy cafe hidden away in the old city, it offers a laid-back but surprisingly productive atmosphere, great coffee, big tables upstairs to spread out on, and a great menu to feed your work. The Birds Nest Cafe will make sure work still feels like a holiday. Have your coffee the Thai Way at Iberry Cafe. Finally, if you are tired of being surrounded by ‘Farang’ (foreigners), then head slightly off the beaten track and onto the Thai tourist circuit at Iberry. The creation of Udom Taepanich – a Thai comedian – this ice cream café does surprisingly good coffee, is great for photos, and a fun way to spend a few hours escaping the heat in ice cool air con, amid stylish holiday hipsters from Bangkok. Bring your camera for some shots of the unique and crazy decor. If coffee is not your thing, then Thailand has a great alternative available – Thai milk tea. A sweet concoction of strongly brewed ceylon tea, some spices, sweetened condensed milk, and sugar, iced ‘cha nom sot’ as it is also known is an orangey color and a more mellow caffeine fix. Thai tea can be found at all the above cafes (except Ristr8to which only serves coffee…and waffles). So there you have it: 6 great caffeinated places to visit whilst exploring Chiang Mai, Thailand. But remember, the city is covered with cafes, and you will never be far from one! If you have any other recommendations, let us know in the comments section below. 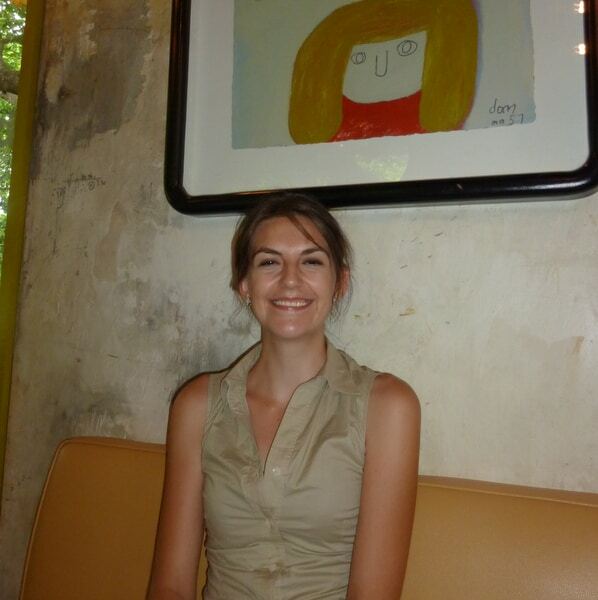 Laura Gibbs has been living in Asia for the last 3 years, based in Thailand. Between travelling she has worked at a Thai university and Bursmese NGO and drinks copious amounts of coffee, with the exception of a 3 month tea detox in Japan. Her new hobby is blogging, and she has recently started a Chiang Mai Coffee Review site in a hope to categorize all the cool, quirky, hip, and ridiculously fun cafes to visit in and around Chiang Mai. She also blogs at Travelling Thailand and Japan in order to show her friends and curious travelers where to visit and the amazing things experienced so far in her Asian fling. 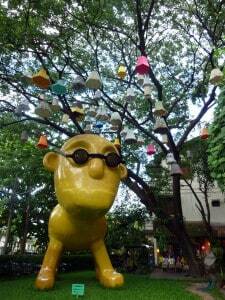 My favorite place to drink coffee in Chiang Mai is Penguin Ghetto. It’s a small place and they have the best iced green tea in the world! Yes – penguin Ghetto is one of my favourite places to meet friends! We have been living in Chiang Mai for a month now and have never been to any of these coffee shops! Must check out the birds nest, looks great! 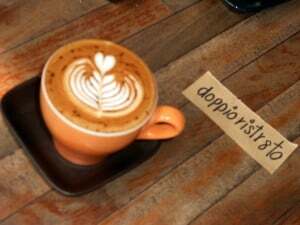 well there are so many cafes here no wonder you havent been to these 5 – It was a good while (and many bad visits) before I found good places to go! My favorite is Coffee Lovers. Love sitting on those relaxing seats at the front. Good Morning Chiang Mai is also a good option. Been to IBerry but didn’t really like it. Interesting for one visit, but not somewhere that I could spend some time relaxing. Here’smy list… http://www.renegadetravels.com/best-coffee-shops-in-chiang-mai/. A good tip for getting coffee from Ristr8to is to get it to go. They charge less for takeaway. And it’s really a horrible place to sit anyways. But the coffee is fantastic.